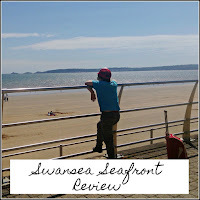 I decided to review Swansea seafront after visiting over the weekend. It was different in many ways to other beaches we've visited, for good and bad reasons, so I really felt it would be useful to note down a few points for anyone who is considering going. 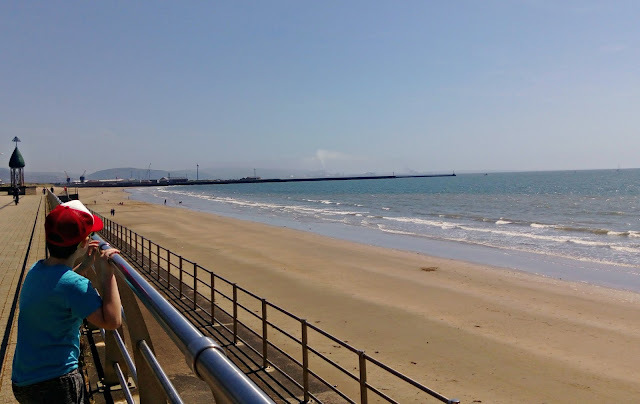 Swansea is the second largest city in Wales, with over 260 shops, and 25 car parks, so it's easy to forget that it is also home to a pretty impressive stretch of coastline. However, if you are thinking of making a visit to the beach, there are a few things you might need to know, particularly if you have little ones, or anyone elderly or infirm in your travelling party. 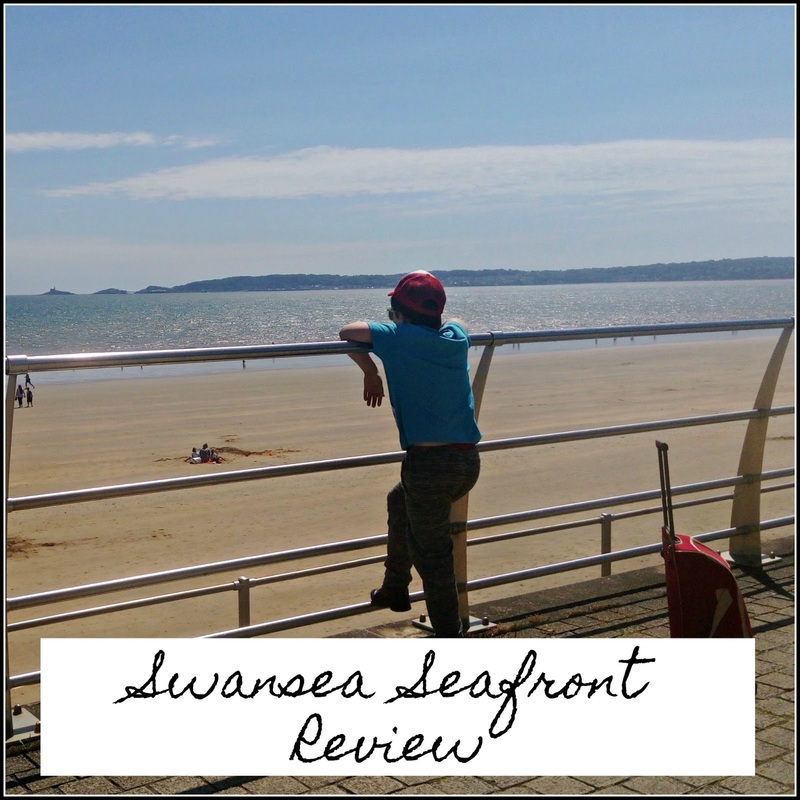 We've been to Swansea, and here's what we learned. We arrived in Swansea by train, and our initial impressions of the city itself were mixed. It was pretty clean and welcoming, but it seemed to be really spread out and the road layout was a bit crazy. There were huge junctions, several lanes across, with pedestrian crossings that stayed red for what seemed like forever, while nothing moved. There were lots of people just running across the road anyway, because the wait was so long and there didn't appear to be any cars coming. We spent a lot of time waiting at those crossings! The seafront was meant to be about ten minutes walk from the station, according to the map, so we decided to walk to the city centre, which was five minutes away, and find a cup of tea in order to breakup the journey. We found the centre easily enough and a lovely little tea shop, in Picton Arcade, where three tea and cakes cost just £6. Bargain. 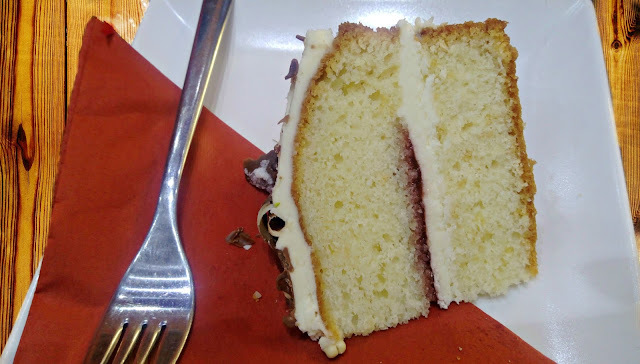 More cake, anyone? After our lovely pit stop, we set off for the seafront. Which is where we hit our first snag. We couldn't find any signs! There were hardly any signposts at all and none that we could find for the beach. We ended up relying on Google maps and rudimentary orienteering, which didn't end well, when we ended up going the wrong way! We did eventually find the beach, but it was very confusing and took much longer than it should have done. However, when we got there, we were amazed at how lovely it was. A vast expanse of unspoilt sand. These steep stone steps, with no hand rail, represent the easiest way to get onto the beach. In the other direction, there are steps with so much height, that a man of six foot two was struggling to walk down them. I actually think these steps are achitecturally stunning, but, my goodness, they present a challenge for anyone who struggles to walk! Also, the elderly, who tend to be less steady on their feet and parents with buggies would have a big problem too. It was telling that there were a lot of elderly people sitting on the benches above the beach, looking out to sea, as I really can't see how they could have got down to the sand. I did see one or two parents struggle down with buggies, but it wasn't easy. A handrail would have made a difference. 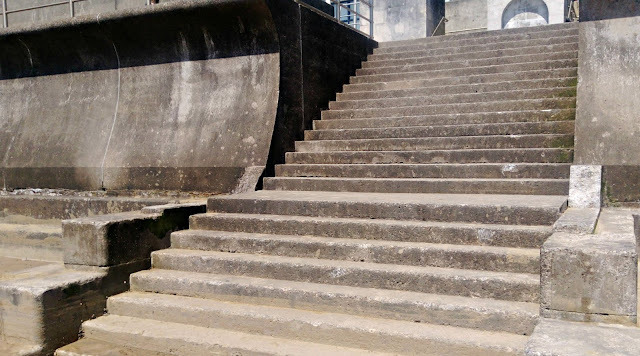 I understand that the sea wall is necessary for when the weather is less favourable than it was today, but small adjustments, such as making the steps shallower, or adding handrails where possible, would make the sand a lot more accessible for many. On the subject of being picky about the lack of facilities, a toilet would have been wonderful. I think, though I didn't check this, there may have been one in the civic centre at the top of the steps. It had a little cafe, so it would make sense there might have been a loo, but those steps were just awful, so once I was down, that was it, I didn't go back up until we were done for the day. If not a loo, a standpipe would be enormously helpful, as the sea was pretty far away, as you can see, so washing grubby children was near impossible! Also, although the beach was clean, the sea was full of silt and grime, so dunking was fairly counterproductive anyway. In conclusion, the beach at Swansea has enormous potential. The beauty of it is that the lack of facilities mean it's not at all busy or crowded. With a little forward planning you can have a great, undisturbed, time. Even on the hottest day of the year, there was plenty of room for everyone. I spoke to some locals who said that, until recently, the beach had been pretty dirty and unloved. It has recently had a huge clean up and is now a perfectly acceptable family seaside spot. A few little tweaks would be appreciated, but there's a lot to be said for it. We certainly had a brilliant two days hanging out on the sand. The beach looks beautiful and the blue sky wow weee. 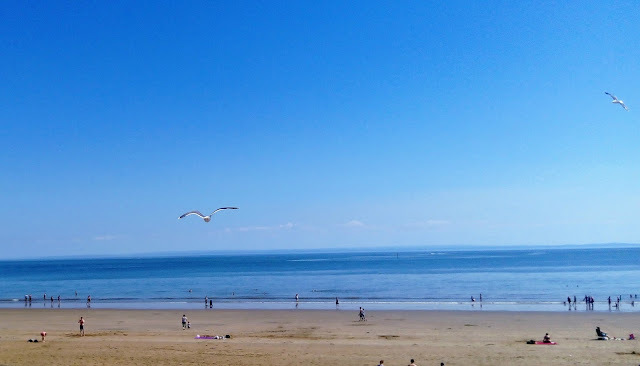 I love beaches that are not crowded, we live near Skeg and its full of arcades and parks and the beach just gets rammed. id rather less facilities and more beach to myself ha ha. Can't say I have ever been to Swansea, let alone the beach. From your pictures and description it seems like Im missing out. Love how the beach doesn't look to full or over populated. Definitely going to be heading down there at some point. That looks like such a nice place to visit! I never think of Wales for beaches but I should do ! I think it looks great!! The cake looks delicious but yes, the seaside is all about the ice cream! This looks pretty idyllic to me, I do love an unspoiled beach. I live in Bournemouth so our beach gets very busy has money spinning opportunities around every corner, which = lots of "I wants"
The beach looks good. Would have been better to have ice cream vans and places to grab stuff though. 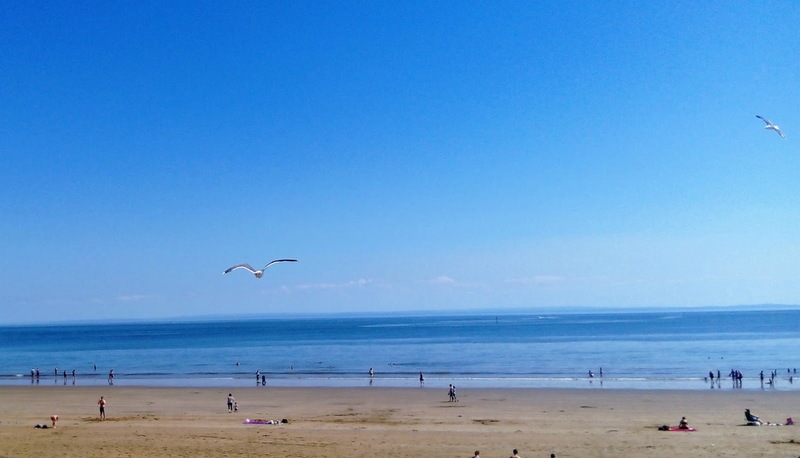 I didn't know Swansea had a beach (useful to know for our holiday next year!). Toilets are essential! I never would have realised Swansea had a beach! Like you said with some improvements it would be Great! We always go down to the Mumbles, it's so beautiful there. The beach is gorgeous where you went but I'd like a few more facilities if I was spending the day there.